May 25, 2010 - The National Transportation Safety Board has developed a five-day course in rotorcraft accident investigation that will be delivered at its training center near Washington in August. The course, which has been in development for more than a year, was designed to provide investigators from regulatory authorities, investigative agencies, private industry, and potential parties to an NTSB investigation, an overview of the procedures, methods and skills required to perform a comprehensive rotorcraft accident investigation. 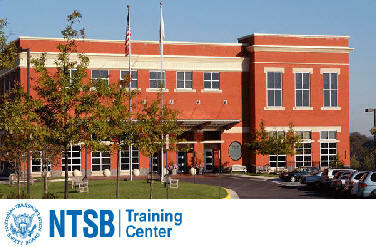 The training will be offered August 16-20, 2010, at the NTSB Training Center in Ashburn, Virginia. Examples from recently concluded investigations will be used to illustrate particular aspects of the investigative process. Case studies may include midair collisions, in- flight fires, in-flight break-ups, and weather-related accidents. The NTSB Training Center was established to improve the training and skills of its own employees, and make its safety expertise more widely available to the diverse transportation community. In 2000, the NTSB selected The George Washington University as the Training Center’s home. In 2001, the NTSB and the university signed a 20-year lease. The new training facility opened in August 2003 in Ashburn, Virginia. The NTSB Training Center is the training facility for the National Transportation Safety Board, an independent federal agency that investigates all civil aviation accidents in the United States and selected accidents in other modes of transportation. The Training Center provides training for NTSB investigators and others from the transportation community to improve their practice of accident investigation techniques. The curriculum promotes independent, objective, and technically advanced accident investigations that will enhance the safety of all modes of transportation. • Utilizing its high-quality training resources to facilitate family assistance and first responder programs, sister agency instruction, and other compatible federal activity. Located on the Virginia campus of The George Washington University in Ashburn, the Training Center is ten miles from Washington Dulles Airport and 30 miles from Washington, D.C.